This patient of Dr. U had initially undergone a body hair transplant with about 6000 grafts to repair the results of a strip surgery performed at another clinic. 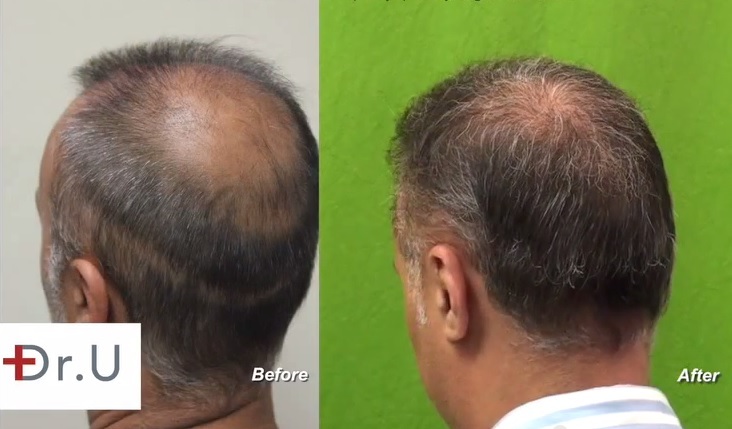 Growth from this other surgery was very minimal and left the patient with a reduced number of hair follicles for the subsequent repair that became necessary. And he was left with a linear scarring from the graft extraction phase of his procedure. The donor supply of 6000 grafts became possible by harvesting non-head hair in the beard regions. This quantity was needed to cover the strip scar and improve the patient’s coverage in the crown, frontal scalp, hairline and temples. The patient was very happy with the outcome of his first procedure. However, he decided to return once more to our clinic to have a second procedure to enhance his density. In this operation, a donor supply of 2000 grafts was extracted and inserted. The total graft count for both procedures ended up being 8047. 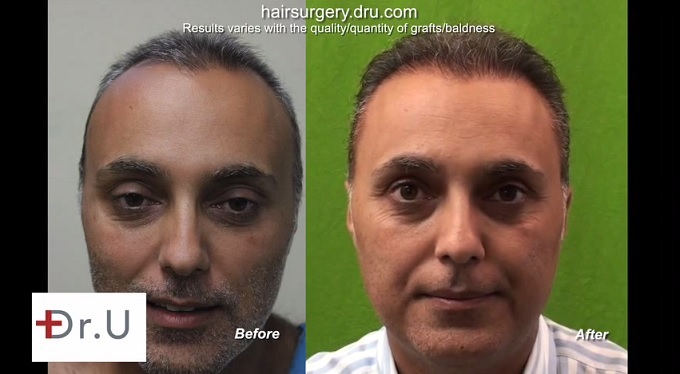 Dr. U’s UGraft technology was engineered with special features that enable large numbers of different types of follicles to be safely extracted so that large donor resources can become a feasible solution for patients like the gentleman shown here. 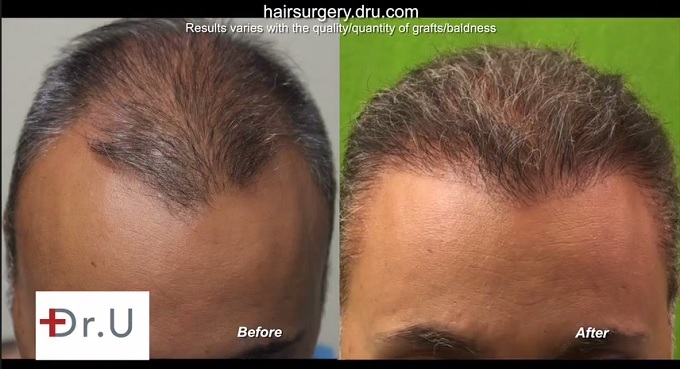 Dr. U harvested a combination of different hair types and thicknesses. 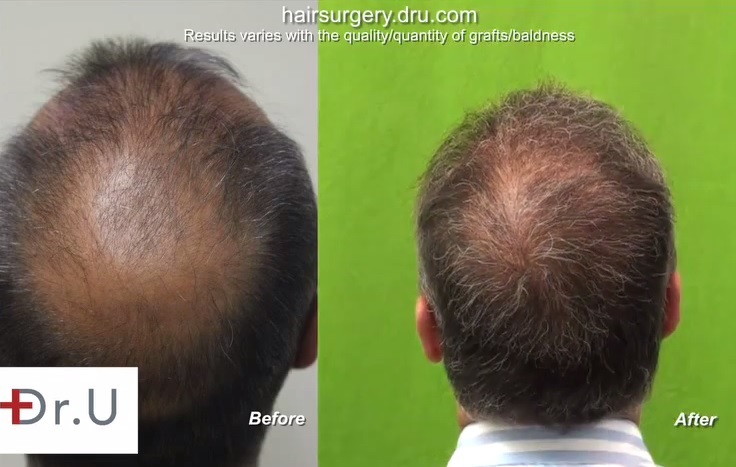 And with this supply, he skillfully inserted the grafts to produce the most natural looking outcome possible for this patient. This includes a gradual and seamless transition from the thinner hairs along the outer edges of the hairline and temples to the thicker hairs on the rest of the head. Watch this patient update video to learn more about this surgery.